Enables you to pick a desired color from any location. It is used to set ScRGB alpha channel value of the color. The alpha channel of a Color structure determines the amount of transparency the Color has. An alpha value of 1 indicates the Color is completely opaque and a value of 0 indicates the color is completely transparent. Sets ScRGB red channel value of the color. Specifies the ScRGB green channel value of the color. Sets ScRGB blue channel value of the color. It stands for “Standard RGB” (and RGB stands for Red-Green-Blue”). All the colors you see on your computer display, are made up of various mixtures of red, green, and blue colors. 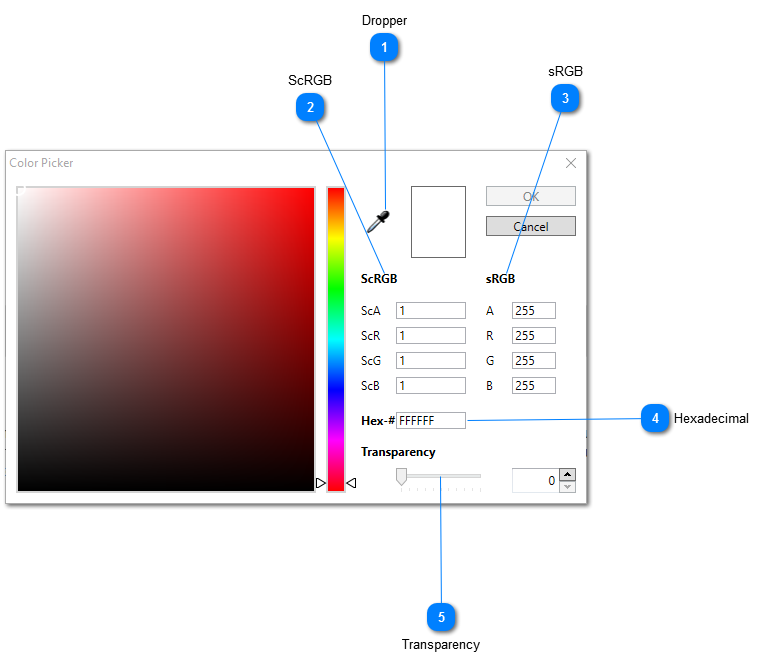 Facilitates you to input any valid hexadecimal value of a color. You can set the transparency for the color according to your requirement.